About this time last week, depending on when you are reading this, I was sick in bed. Considering that I am fortunate to not get sick that often, and also that on those times when I am sick it really involves being bed bound, this indeed was quite a rare occurrence. Don’t get me wrong I enjoy the personal wellness day as much as the next guy but when I am using “sick time” and am actually sick it is a totally different story and far from as fun. 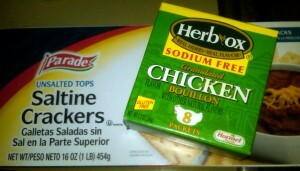 Fueled by saltines and chicken stock I used my idle time well during a recent illness. On my sickest day, I spent much of the day in bed sleeping, eating saltine crackers, drinking massive amounts of Gatorade and sipping chicken broth. During my rare waking hours that did not involve eating and drinking the aforementioned items I tried to watch television. Now, I have a very nice cable package that gives me far more channels than I could possibly watch in a lifetime let alone a day yet despite this fact I found the choices for things to watch very slim. Of course the television in my bedroom does not have the same channel selections as the television in my living room but it was not worth trading my horizontal position in bed with one on a couch so that I could have a few more channels to choose from. So with only so many episodes of In the Heat of the Night and Matlock that one could watch I found myself needing to find other ways to pass the time. I of course could have found a book to read but I had just finished a book on the role Galveston, TX played in the Civil War and had not decided what my next book to read should be. And picking a book while sick is not the wisest of choices since what I feel like reading sick might not be the same thing that I want to read while well. 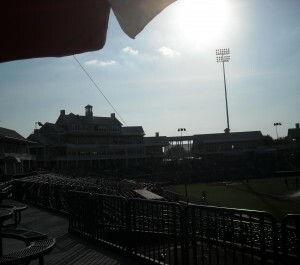 Dr. Pepper Ballpark in Frisco, TX is a place I can go again and again. So with television and books failing me my thoughts quite literally began to wander. And these were not fever induced mind wanderings they were more wanderings out of boredom. While I am sure there are many people who could happily lay in bed all day I am just not wired that way. About halfway through the day I began to get antsy and wanting to not be trapped inside. Of course I did not really know what I would do if I were to go outside but the very fact that I could not go outside was enough to give me that cooped-in feeling. So with only my mind to entertain me, and less than a week removed from a vacation I did what any normal person would do, I started thinking of ideas for additional vacations. In particular I thought of baseball ballparks to add to my bucket list to go see and some of my favorite past ballparks that need one of my annual visits. In no particular order the following ballparks were considered with four ballparks that I have never seen and want to and four ballparks that I just can’t seem to see enough. Let’s start with the four ballparks that are worth visiting again and again. 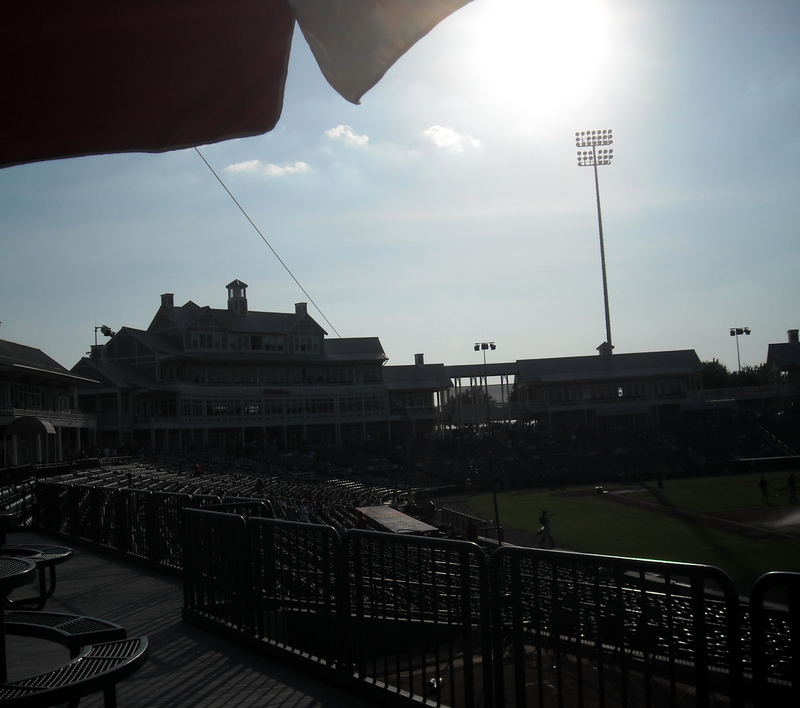 Dr. Pepper Ballpark in Frisco TX is the home of the Frisco Roughriders, the Double-A affiliate for the Texas Rangers. The Ballpark includes a swimming pool among other amenities and is the only ballpark to include seats on all sides of the bullpens to give fans a truly unique experience. At just over four hours away it is also one of the closest affiliated Minor League ballparks I can get to. As it gets very warm in the Dallas area in the summer it is a Ballpark best visited prior to the end of July. Bayfront Stadium in Pensacola, FL. is another one of the ballparks I just can’t get enough of. 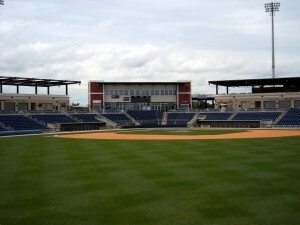 Bayfront Stadium in Pensacola, FL. 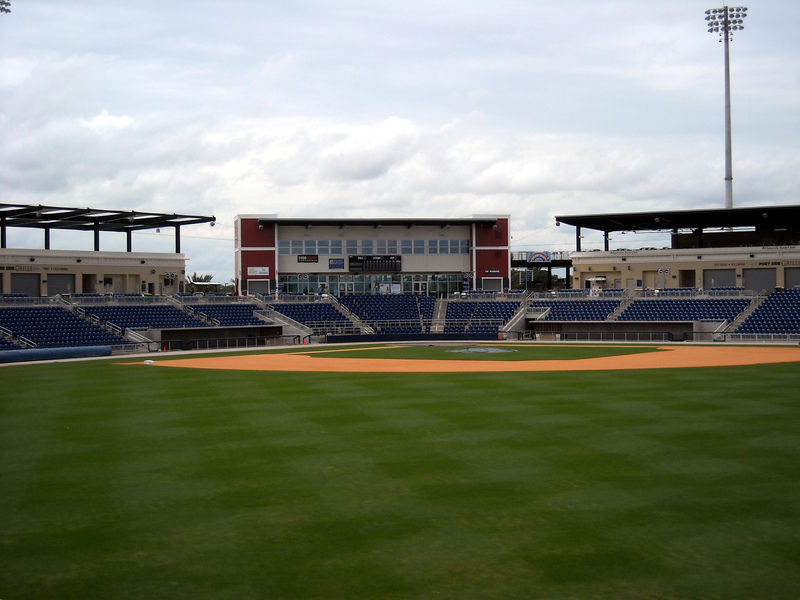 is the home of the Pensacola Blue Wahoos, the Double-A affiliate of the Cincinnati Reds. The Ballpark sits overlooking the water and combines great views and competitive Southern League action. Of course the proximity to the beaches of Pensacola does not hurt when it comes to making the eight hour drive east. 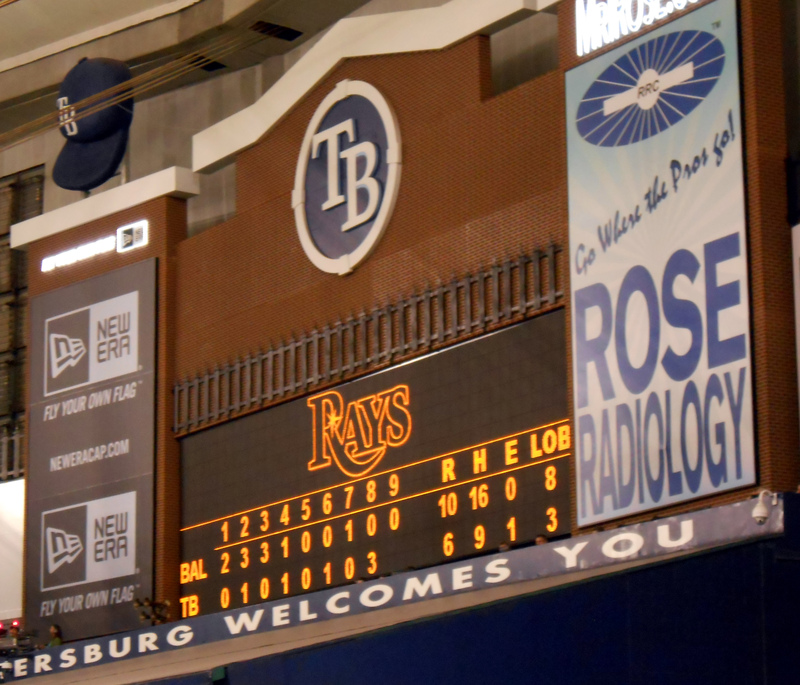 Lest I leave out the Major League ballparks, Tropicana Field in St. Petersburg, FL, home of the Tampa Bay Rays is truly a fun Ballpark to visit. I know it continues to get a bad wrap due to perceived issues related to its age but when it is 97 degrees outside and 72 degrees inside where the game is being played it is hard to beat. Of course when not watching the game action one can visit the Stingray touch tank in center field as well as the Ted Williams Museum. And did I mention that all of this can be accomplished with it dry and cool? It has a roof to keep out the rain. It has ice cold A/C to set you free. It has a ray feeding tank and the Ted Williams Museum. What Tropicana Field lacks is respect from the wider baseball community who seem set on tearing it down. 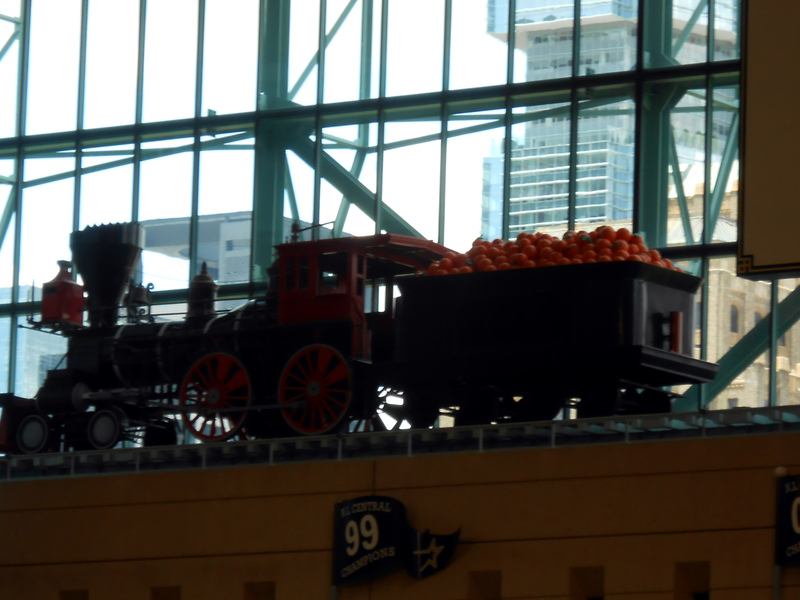 And of course one needs to include the hometown ballpark Minute Maid Park. Home to the Astros and the place that I have seen the most regular season games it is also an oasis from the heat and rain like Tropicana Field. It also includes a train above the outfield and a flagpole within fair territory. It is years away from a consistently competitive home team but the Ballpark cannot be blamed for that. So that concludes our look at four ballparks I enjoy seeing again and again. Now let’s look at four Ballparks that I just haven’t made it to yet but can’t wait to see. 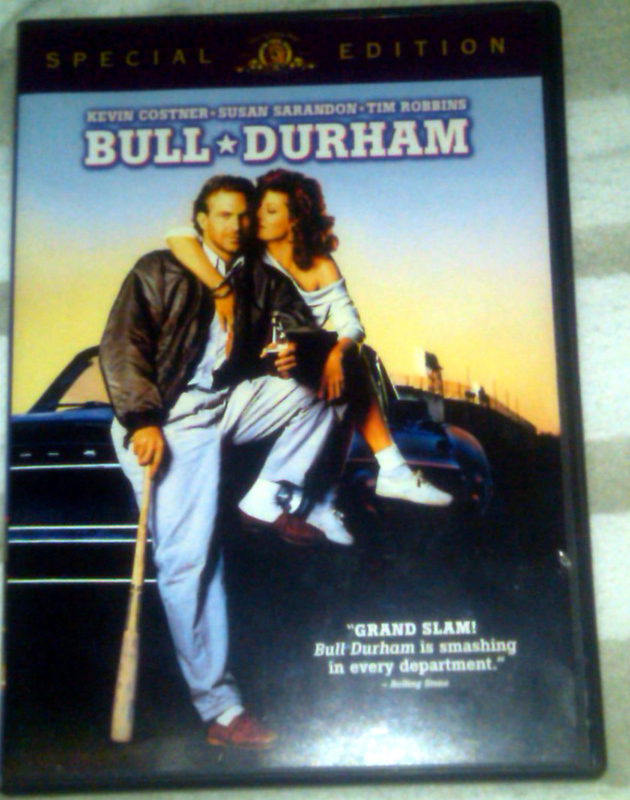 As mentioned a week or two ago I love the movie Bull Durham so it makes sense that I would want to take a trip to see the Durham Bulls play at Durham Bulls Athletic Park. Sadly the Bulls no longer play in the historic Ballpark featured in the movie but it would still be nice to see a game there and drive by the old Ballpark as well. The Washington Nationals’ Double-A affiliate the Harrisburg Senators play at Metro Bank Park in Harrisburg, PA. Metro Bank Park is located on an island. Not a large island like say Oahu but an island that is basically large enough for the Ballpark and some parking. Once I learned of this Ballpark a few years back it quickly rose to the top five that I wanted to see. I mean think about it, an island just big enough for a Ballpark. It doesn’t get much more unusual than that. 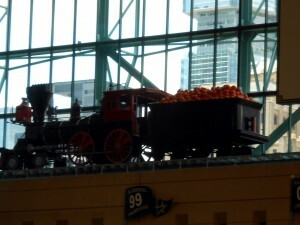 Minute Maid Park has a train that blows its whistle whenever the Astros hit a home run. The train has not made much noise the past few years but is still better to look at than the eyesore billboards in center field. Oriole Park at Camden Yards in Baltimore, MD is the Ballpark most credited with ushering in a return to the era of baseball-only Ballparks. Even if it were not home to my beloved Baltimore Orioles I would still want to see a game there just for the fact of all that it inspired. The fact that it is home to the Baltimore Orioles certainly adds an extra degree of wanting to see it though. Rogers Centre in Toronto, Ontario, Canada. Watching baseball in another country. Need I say more? So those were some Ballparks that my weakened self thought of seeing during my recent illness. Now I just need to flesh out the plans to see them again and in some case for the first time. Now if you’ll excuse me, I need to replenish my supply of soup and other supplies in preparation for my next illness and also get some road trip supplies just in case the urge to catch a game strikes. Tomorrow marks the 25th anniversary of the release of a movie about the ins and outs of Minor League Baseball. The movie that is causing all of the hoopla is of course Bull Durham, or as I like to call it the base of the Kevin Costner baseball movie triangle that also includes Field of Dreams and For Love of the Game. While Bull Durham enjoyed modest success during its theatrical run, it gained wider popularity in the years following to the point that celebrating the quarter century mark since it was released is kind of a big deal. Tomorrow marks the 25th Anniversary of Bull Durham and people have been quoting lines from it ever since. While each of the sides of the Kevin Costner Baseball Triangle are good in their own ways I have always identified more with the comedy infused Durham. I still watch both Bull Durham and Field of Dreams each year at the start of the baseball season and both still make me laugh and cry in various ways so many years later. I suppose Bull Durham resonates with me so well because while I was never a Minor League Baseball player I was very much a Minor League Baseball fan and was attending games around the same time that the movie came out. So the movie showed me the parts of Minor League life that I didn’t see from my view in the stands. The movie also provided several concepts that I use even today as part of my daily life. The concept of creating your own rain delay when the grind gets to tough and you just need a day to catch your breath is a theme that I have embraced from the movie. While I have never turned on the sprinklers in the office I have certainly found ways to give everyone a rain day here and there. The movie also provided many timeless quotes with some of them being appropriate for repeating and some best left to the professionals. In that respect, the current members of the Durham Bulls, the real-life team that inspired the team in the movie, made a hilarious video reenacting some of the crazier lines from the film. What makes the video of the players recreating the lines so funny, and perhaps makes the rest of us feel a little old, is the fact that many of the players were not alive when the movie first came out. There is something for everyone in the Kevin Costner Baseball Triangle. Another interesting aspect of the real life Durham Bulls is that they serve as the Triple-A affiliate of the Tampa Bay Rays who were 10 years away from existing at the time of the film’s release. As a bit of trivia the Bulls were a Single-A affiliate at the time the movie was made and were owned by one of the filmmakers. But enough about things that weren’t around when the movie came out. It is time to focus on something highlighted in the movie that is no longer around. In the movie and in real life, Max Patkin was the Clown Prince of Baseball. For over 50 years Patkin went to Minor League ballparks across the country and Canada performing his baseball clown act. I was fortunate enough to see Patkin perform during an Orlando Sun Rays game at Tinker Field. Patkin’s act was shown in several scenes and Patkin himself got a dance to himself later in the movie. While it was clear that Patkin was closer to the end of his performing career than the beginning by the time Bull Durham came out it, to this day when I watch his performance scenes it is like I am right there watching him in person and trying to avoid getting sprayed by his water trick. Although he died in 1999 Patkin will forever live on in his scenes from Bull Durham. That is both a testament to the man himself and to the filmmakers for recognizing the important role he played in conveying the essence of Minor League Baseball. Another staple of both the movie and Minor League Baseball in general is road trips on a bus. Unlike the Major League players who travel in first class chartered planes, the Minor League players arrive by bus for all of their road trips. 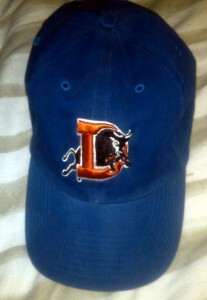 Not much has changed with the Durham Bulls logo since Bull Durham came out. It is still one of the more iconic and recognized looks in the Minor Leagues. When Michael Jordan tried to make it as a baseball player in the late 80’s he bought a luxury bus for the Birmingham Barons to use. Still despite the “luxury” bus features it is hard to picture Air Jordan traveling through the cities of the Southern League in a bus. As for the bus that was used in the movie, that was purchased by a man named Dale Earnhardt Jr. Earnhardt is someone who knows a thing or two about motorized vehicles. While Bull Durham has stood the test of time for 25 years, every once in a while a rumor surfaces about a potential sequel being made. Sequels can certainly be tricky business as few ever really are as good as the first or meet the lofty expectations set for them. 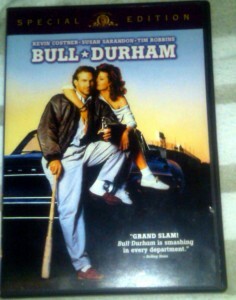 But, even with all of that being said I would still watch a sequel to Bull Durham. Do I think it could ever be as good as the first movie? Probably not. But, it does not have to be as good as the first movie. It just needs to help show where the characters ended up some 25 years after we left them on the porch and field. I have my own ideas about what happened to the characters so if a sequel is never made I will still carry on my version of the story in my head. But it would be nice to see the cast get back together for one more trip around the bases. I have been a baseball fan for a long time but last Thursday I did something that I hadn’t done in three decades of fandom and also did a few things that I had never done before. As mentioned before the first Major League Baseball game I ever attended was a Baltimore Orioles home game at Memorial Stadium in 1983. Since then I have seen numerous Orioles Spring Training games over the years in ballparks all across Florida. But for 30 years I had not seen the Orioles play in a game that counted in the regular season standings. I had also never seen them play in a regular season game outside of Charm City. The Baltimore Orioles came to Minute Maid Park and a 30-year drought was ended. When this year’s MLB schedule was released and I saw that the Orioles were coming to Houston to play the Astros, it was a no brainer that I would circle one of those games on my must watch list for the season. That lucky three decade drought ending game was Thursday afternoon at Minute Maid Park. Of course, I did not just end the 30 year drought with one game in one city. No, no. I went one step further in true go big or go home fashion and saw the Orioles in St. Petersburg, FL as well when they wrapped up a series with the Tampa Bay Rays. So in the course of four days I ended a 30-year drought with not one, but two, games in two different cities in two different states. So let us compare and contrast the two ballpark experiences starting first with the Orioles and their visit to Minute Maid Park. Four days after seeing the Orioles in Houston it was time to travel south and see them in Florida but unlike previous times watching the team in Florida this game counted. Selecting a day game to see the Orioles was an easy choice to make as I try to attend one day game a season. Thursday was this year’s selection for that honor. I enjoy day games for multiple reasons, but two in particular rise above the others. The first reason of course is that it just seems down right fun to be sitting at a ballpark watching a game while the majority of the world is working. The second thing that makes day games so much fun is that they have smaller crowds on average (see reason one as a probable cause) which tends to mean better odds to catch a ball during batting practice. For the past three years I have caught a ball at all of the day games I have attended. 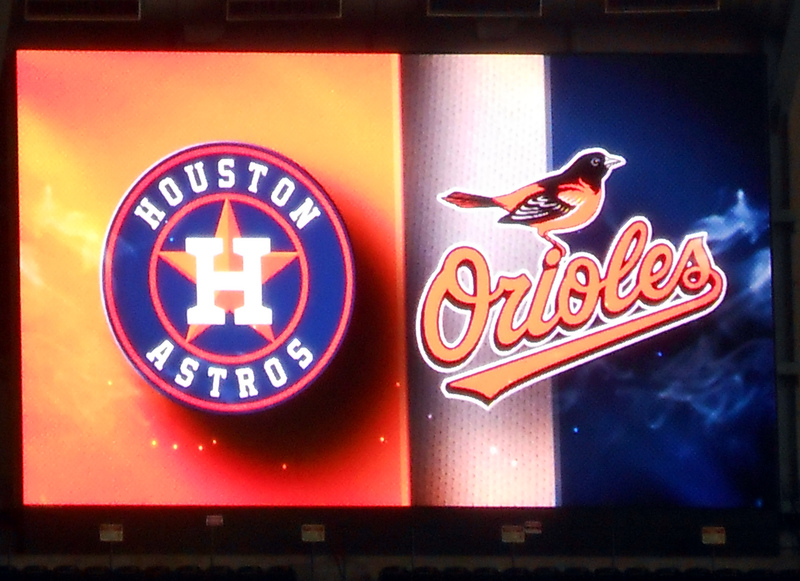 So it was that experience that had me feeling fairly confident that my luck would continue this year when I went to see the Orioles visit the Astros. I arrived at the gate shortly after it opened and made it to my seat in front of the short right field porch. Sadly when I surveyed the field I noticed that batting practice was not going on. At first I thought that it was just starting later than usual but then I realized that none of the tell tale signs of batting practice were on the field. I would not get to continue my streak of catching batting practice balls. I know I can always add another day game later in the season but I thought that it would have been nice to catch a ball from one of the Orioles. The game itself was nice once the disappointment of no batting practice subsided. The Orioles ended up with the victory and although I did not go home with a ball I could be consoled by the fact that I saw a victory by the first team I ever rooted for. 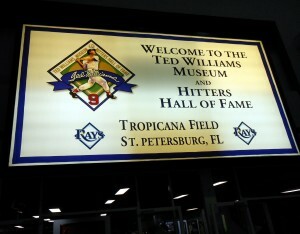 The Ted Williams Museum inside Tropicana Field is well worth checking out. My Orioles karma continued Sunday at Tropicana Field, as did my string of missing out on batting practice. 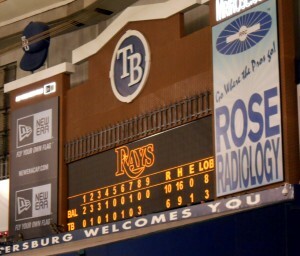 As was the case earlier in the week the Orioles were victorious although the Rays definitely went down swinging. In both instances I was conflicted somewhat regarding who to root for since all three teams are in my stable of teams that I follow. But in most case during head to head match ups I will tend to pull for the Orioles. So in that sense I saw two Orioles victories in four days and was happy. 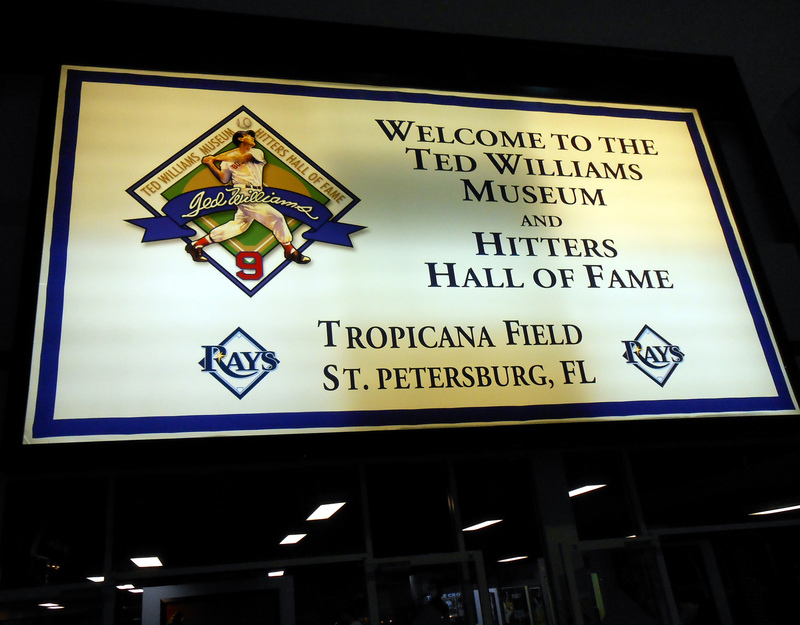 Tropicana Field is also home to a Ted Williams museum which is a must stop for any visitor to the ballpark. 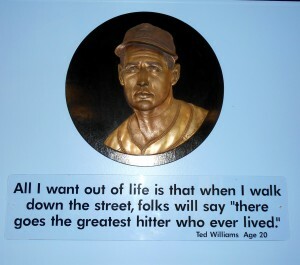 Admission to the museum is included as part of admission to the game and allows fans to see various artifacts from both Ted Williams as well as artifacts from the earliest Rays season. Now if you’ll excuse me I need to think of some other long droughts to end while I am one such a roll. Enter your email address to follow Southpaw Musings and receive notifications of new posts by email. Covering the world of baseball one pitch at a time.